Organisations that incorporate coaching or Mentoring into their culture see sustainable improvements in key areas, including internal and external communications, productivity, employee attitudes, and recruitment and retention of staff. Question - Where would a top sportsman be without their coach? 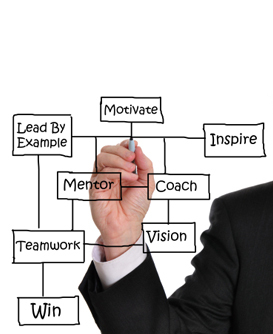 Where could your business be with a coach/mentor? The benefits of hiring a professional coach/mentor will enhance your employees performance and your business success and move both beyond the comfort zone to real fulfilment and growth. There are a number of reasons to choose this as a development activity. Whether it's for a specific reason, or a long-term development activity, our capability cover all aspects. To support the induction or appointment of a senior person into a more senior, or different role. To bounce ideas or thoughts confidentially. To accelerate the personal development of individuals defined as ‘high potential’. As a critical friend or independent sounding board to a senior individual. To support senior individuals engaged in wider personal effectiveness programmes, such as 360-degree appraisal or development centres. As a means of rewarding and retaining key staff critical to the business. To give senior individuals development that is private and avoids the public gaze. Some senior managers may consider they have "made it" and worry that being seen to undergo development can be perceived by others as admitting they have a weakness. As a way of fitting development around a busy individual's other diary commitments. Attendance on whole-day courses can seem an imposition into an already hectic schedule. "Prior to the coaching sessions I was stressed out and thinking of quitting my job. I am now more positive and settled in my supervisory role. Communications and relationships have improved within my team. My own stress levels have been reduced and the work is more enjoyable and more efficient."